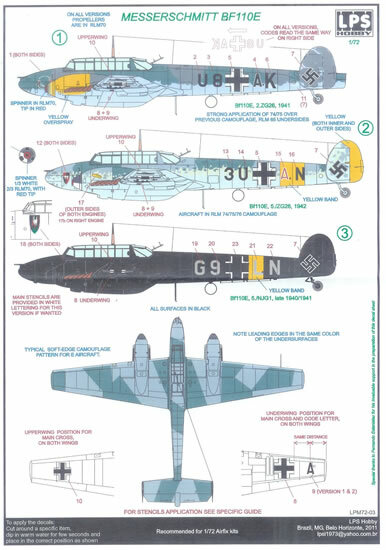 3 subjects per set, water-slide decals, coloured painting & markings guide plus stencil placement guide. Excellent decal quality and attractive subject choices. The stencil placement guide is excellent. Insufficient national insignia and stencils for all three schemes per set. Excellent production quality for the decals, good instructions with an excellent stencil placement guide. I feel these sets are expensive given that only three schemes are offered in each case, with insufficient national insignia & stencils to complete all options the set provides individual markings for. The Bf 110 is perhaps the best known representative of twin-engined heavy-fighter concept popular with several nations in the late 1930’s. Although the Battle of Britain revealed its vulnerability to modern single-engined fighters, it still provided useful service in many roles for the duration of WW2. 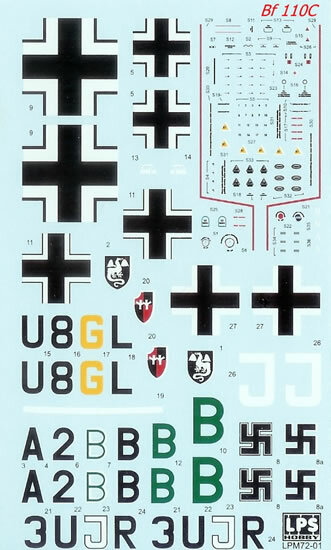 As such it’s a true classic and a justifiably popular modelling subject; so some new decal sheets covering of schemes are sure to be welcomed by many. Each set of decals comes in a zip-lock plastic bag. An A-5 sized header is printed in colour, as are the painting and decaling guides. These are I think ink-jet printed on rather thin paper. They have a matt finish, with some colours looking a bit faded, although to be fair, it is not necessary for the guides to have exactly the right colours illustrated. I have to say that I had little a more positive impression of these instructions than those I reviewed very recently for three LPS Hobby P-47 decal sets, even though the format is essentially the same. The Thunderbolt instructions seemed a bit bland in appearance, although quite adequate for their intended purpose. This said the Bf 110 instructions still have just a little bit of a budget feel when compared to some other popular decal brands. Colour call-outs refer to RLM numbers as you would expect. The instructions are replete with useful notes on markings and paint finish, including alterations to the standard scheme or variations evident in photos. 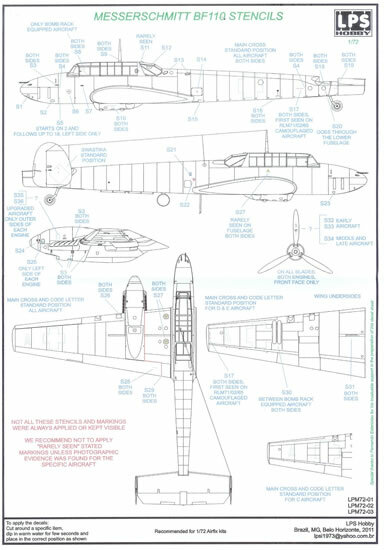 Another very useful feature is that key measurements, expressed as proportions of spacing, between markings are provided for the underwing national insignia and unit codes. 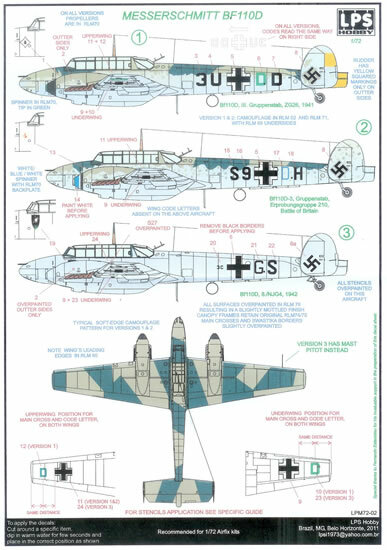 One thing that did surprise me is that the exception of one small plan view for the Bf 110C, none of the plan views show upper wing national insignia placement. However this is indicated as a “ghost” outline in the stencil guide with each set. The stencil placement guide is common to all three sets, and is extremely thorough. It identifies rarely seen stencils and recommends they not be applied unless photographic evidence dictates that they should be. They also identify stencils specific to bomb-rack equipped aircraft, as well as different propeller logos for early and late production machines. 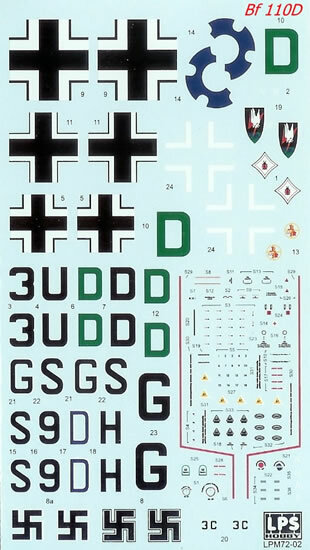 Given the guide’s wide applicability it is all the more a pity that only one complete stencil set of decals is supplied. 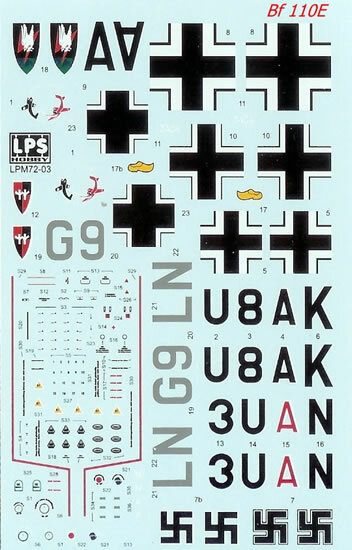 The instructions also note that the stencils are intended to extend those provided with the new Airfix Bf 110 kit, and correct the main national insignia. 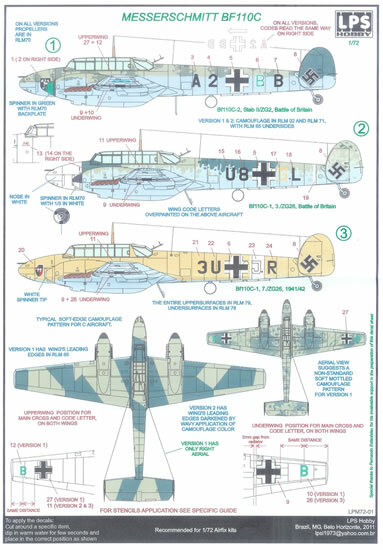 I suppose that it is in this regard that decal’s header advises that they are intended for the Airfix kit, as obviously they should suit any brand 1/72 Bf 110 kit of the appropriate version (and there are spinner decals for the Bf 100D S9+DH that are probably specific to the Airfix kit). The decals are printed by Micro Scale and appear to be of excellent quality, with superb registration and what looks like good opacity. Three subjects per sheet are fine as such, but the sheets are fairly small and lack sufficient national insignia and stencils to complete all three options covered by each set. I don’t often address price, but I feel that these sets are a rather expensive compared to brands with equivalent quality decals using the same size packaging, but offering either more subject choices and/or complete markings sets for each subject. For the money I’d like to be able to complete each subject without resorting to other sources for additional national insignia and stencils. The quality of the decals in these sets appears to be excellent, and this obviously counts for a lot. The subject choices are also generally interesting and attractive, and for many will be enough to justify their purchase. I think that the sets are a bit expensive compared to similar sized packages from other producers, and would offer more justifiable value if full sets of national insignia and stencils were included for each option. Thanks to LPS Hobby for this sample.